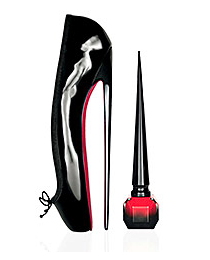 ALL women know the most iconic shoe brand to ever exist: Christian Louboutin. Known for his signature red-bottomed soles, this eccentric, shoe-fetishing Frenchman charges nearly $1,000 for his cheapest pair. Well, ladies - now you can own something by the renowned designer that is a little cheaper. He's bottled his famous hue into a nail polish for the modest price of $50.00. Don't forget to save all the specs of nail polish that chip off - each piece is at least 50 cents.